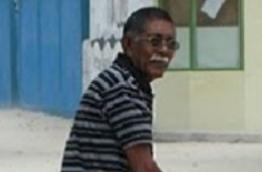 Hussain Mohamed Manik, who was found murdered in the island of Hoarafushi in Haa Alif Atoll in 2010. High Court on Sunday upheld the life imprisonment sentence of one of three men convicted over the death of an elderly man in Hoarafushi, Haa Alif Atoll, in 2010. Mohamed Latheef, Nooman Abdulla, and Ahmed Ibrahim were convicted of terrorism and sentenced to 25 years' imprisonment, over kidnapping and torturing Hussain Mohamed Manik to extort money from the elderly man. The appellate court upheld the verdict of Ahmed Ibrahim. The court also scheduled an appeal hearing on Monday for Mohamed Latheef, who is a nephew of the late Manik. Ahmed Ibrahim appealed to nullify his life sentence, claiming that he was not provided a lawyer during the investigation, that the evidence submitted was not enough to find him guilty as per the Constitution, and that his verdict was wrongful. However, the High Court noted that Ahmed Ibrahim had signed and put his fingerprint on the documents regarding the charges against him, which specified the legal rights granted to him. According to the High Court, a lawyer was appointed to Ibrahim during the investigation, and police assistance also provided for the lawyer upon facing obstructions from the people of Hoarafushi. The ruling further highlighted that Ibrahim had agreed to proceed with the investigation in the absence of a lawyer before changing his mind. He had exercised his right to silence later when asked to sign his statement. A lawyer was appointed to Ibrahim during the trial. The court also refuted Ibrahim's claim of lacking enough evidence. The verdict noted that Ibrahim, upon his arrest, had cooperated with the investigation, pointing out the evidences on the crime scene, revealing some of the crime-related items the perpetrators had hidden, and the stolen money as well. The court further highlighted that forensic analyses also connected Ahmed Ibrahim to the evidence collected from the scene. Moreover, the ruling stated that the Criminal Court's verdict was based not only on Ibrahim's statement during the investigation, but other evidence and forensic reports. Chief Judge Shujau Usman, Judge Hussain Shaheed, and Judge Mohamed Niyaz unanimously agreed to uphold the lower court's sentence. Hussain Mohamed Manik was abducted on the night of September 27, 2010. During the Criminal Court trials, prosecutors had stated that Manik was taken to an empty land plot, where he had been suffocated with sand stuffed in his mouth. The prosecutors also noted that large sums of money had been stolen from Manik’s house.